The full production OXE Diesel 200hp high performance outboard diesel engine makes its defence show debut at DSEi demonstrated by UK & Ireland distributor, Proteum Ltd. 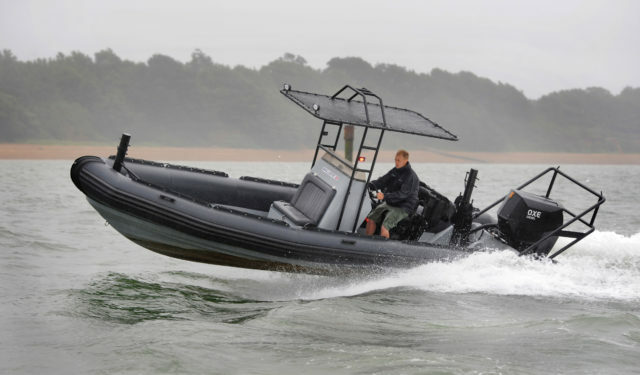 The OXE Diesel outboard engine will be powering a JBT Marine 7.8m Ballistic Rigid Inflatable Boat (RIB). This will showcase the OXE’s horsepower, range and extreme environment performance for military and security operations. Since Proteum launched OXE Diesel into the defence market as a pre-production unit, OXE has entered service worldwide in a variety of applications. Production is accelerating to meet growing demand. Future power options from 100hp to 400hp are planned by OXE manufacturer, CIMCO Marine. OXE runs on NATO F75/76 fuels and all other standard EN 590 diesel fuels. As NATO’s single fuel policy continues to drive the transition away from petrol to diesel, the OXE Diesel provides military operators with a viable diesel outboard. “OXE is fast establishing itself as the credible production diesel outboard of this horsepower available to military and security operators”, said Jeremy Paul, General Manager of Proteum. Proteum provide sales, support, spares, maintenance and training for marine products. They are an SC Group company.